Topic: GSP pup and babies/infants? We will be having a NAVHDA test in October. We still spots open. Maybe we will see you there. I am in the same boat as you but on the other side of the mountain in TN. I'm going to try and hit Cherokee National Forest some this fall winter. It will be a long weekend. Friday I've got the Derby in TN and Saturday I've got the NA in NC. It should be fun. Topic: Brag on someone else!!! Bob tested and got a utility title on Rebel. Topic: Does anyone hunt fur with their DK or GSP? Here is a link to litter last Oct. in KY.
For all you folks down in GA the Mid-South NAVHDA chapter will have a sub-chapter in the Atlanta area. Here is a link to the website http://www.navhdaga.org/ Bill Green (billy on this site) can more than likely tell you more about it. Has anyone ever hunted grouse in east TN, N.C. GA in the Appalachian Mountains? I've seen two diiferent articles about the grouse hunting in the area. I know it's not the same as up north but I may give it a try in the south this year. How is your wirehair doing? Got any new pics? I did not think to get in touch with Dave. I'll make sure he knows about the next training day. I just got a new camera so I had to take a bunch of pictures at the Mid-South NAVHDA training day. Here is a slide show of the day. The next training day should be the third weekend of Sept. if anyone is interested. I don't think the dog that was coming to you for training will be making it Phil. She has a pretty bad case. If you don't mind me asking, what litter are you getting a pup out of? Sounds like a good time was had by all. So are you getting Katie ready for that UT test? Topic: What do you do for a living? I am starting tracking training with my pup. Topic: New Walnut Hill Pup! I could have never talked my wife into another pup. That is funny that Rick and you now both have one of those hairy dogs. He looks even better in person. I got to watch him playing around at the Mid-South NAVHDA test. I saw a gwp listed on a site out of the same stud. She is a pup about 6 months old http://www.gundogsonline.com/hunting-do ... 29954.html I wonder if it is the same litter? Thanks for the kind words. I had a blast (even though I did not run). I was a pleasure to get to see all of the dogs work and I can't wait to run myself. Anyone who is in the general area is welcomed to come to a training day to train with us. Shoot me a pm or e-mail for info. I had to be back to Nashville by 3 or I would have stayed to watch the more experienced dogs. I was hoping to get to see all of yalls dogs but I had to leave to early. I'm not running in the test so I'll get to see everyone run hopefully. I am glad I final got to meet Brenda. I wish I would have got to watch everyones dogs work more and actually get to talk with some of the folks. Maybe at the test I'll get my chance. Topic: What kind of dog are you? What is a good age to enter a pup in a hunt test? I know it depends on the dog but what is the youngest some of you have seen in a junior hunt test? How about the oldest dog in a junior hunt test? I am not sure what region, maybe Dixie. I spoke with one of the guys who was judging and he said he'd help me out on the retrieving part. I need to work on more than retrieving (like my shooting) but I had a blast. I figure by next fall when it kicks back up I may dive in. Topic: Sportdog 2400 vs. Dogtra 1200NC? I've got the SportDog 1200 and love it. I've never used the other one so I could not give an opinion. Another plus is SportDog is in your backyard. I had a button fall off my controler and they sent me a replacement next day mail. Very helpful. 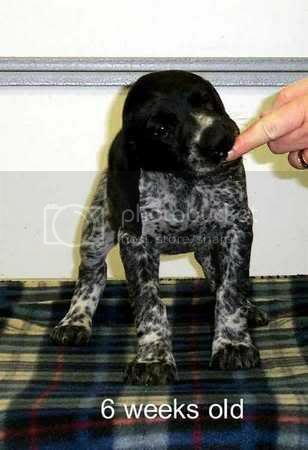 Here is a picture of the pup I will be getting next week. She is 6 weeks in the picture. I will be getting her at 8 weeks. Is anyone running this weekend at the GSPC of Middle Tennessee Field Trial? Topic: Hunting with a Versatile Dog! I have a pup coming in February that I hope can do everything you mentioned. That is truely awesome. I know you train your own dogs but can you recommend any type of training books or material to follow?